There are probably quite a few people out there who've never used film, or who only had a cheap compact camera before buying a DSLR. This article aims to show you how to use those little cartridges which some shops still sell (although buying online will give you more choice, unless you have a decent camera shop near you). 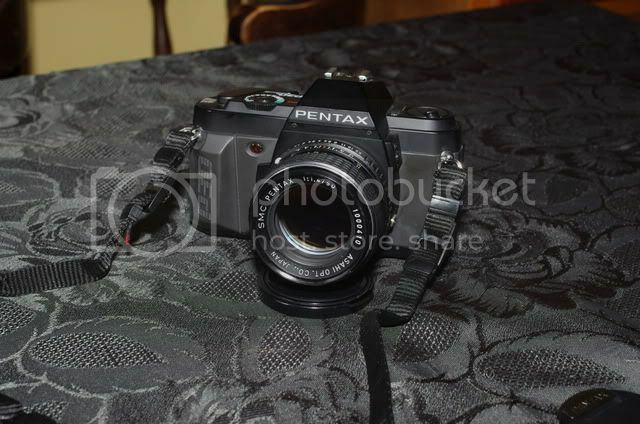 I'm using a Pentax P30n for this, mostly as they are now ridiculously cheap on ebay. I paid £10 for this one, which came with a ghastly Pentax-A 28-80mm lens (the cheap non-SMC coated one which is generally regarded as a doorstop), a Pentax AF260SA flash (which I used for the photos in this article), case, strap, and a few other oddments. They are simple, lightweight cameras which can use any K mount lens from K to FA, although you need to stick to lenses with an aperture ring to have any control over the process. While not as nice as, say, an MX or KX they are a decade or so younger and don't tend to need much maintenance before use. 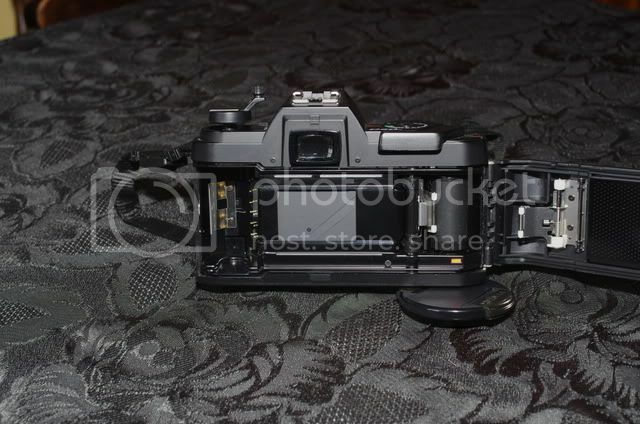 The older cameras which fetch higher prices tend to need a good clean and new light seals. Against that a cheap P30 series makes a good deal of sense for a beginner. 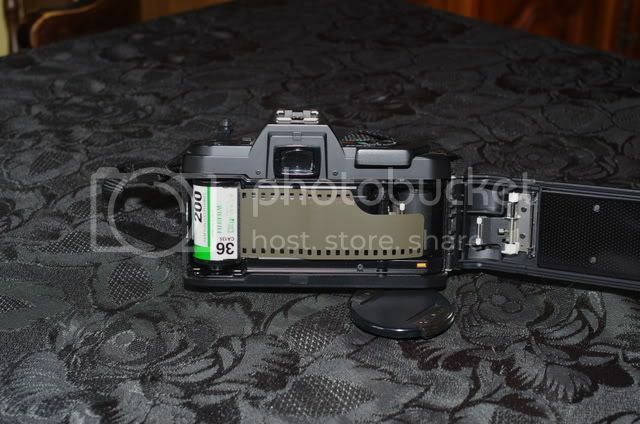 It has a more accurate light meter and shutter mechanism than the K1000 too. 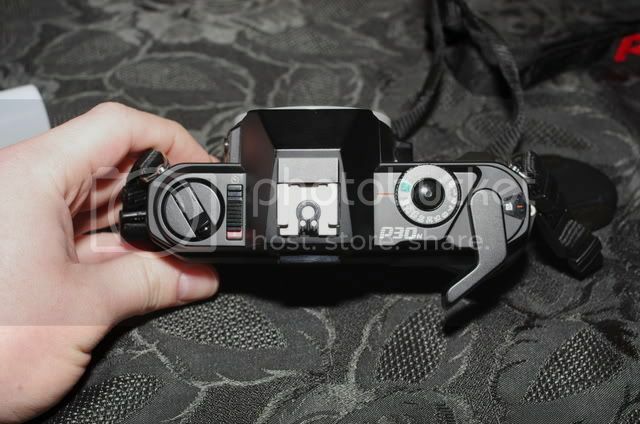 Pentax launched the P30 series with the original P30, then the P30n and P30t. They were also sold as the P3 and P3n in the USA, in the event that you find someone's holiday purchase for sale. There are variants with slightly different colours too, but the innards are the same. In terms of loading film and shooting they are identical, the later two have Av mode and not all P30s have a socket for a cable release. All will offer program mode with an A series or later lens, or metered manual if you move the lens from the A setting. See the manuals for the various models for more information - typing "Pentax [insert model] manual" into a search engine should bring up a couple of sites. Here's the camera from the back. The small vertical window allows you to see that there's no film inside, so pull up the rewind crank to open the camera. If you've just bought it, try winding on and shooting without film a few times to check that it works. Generally these are either fully functional or dead! The film goes in the space on the left of the camera. You may need to pull the rewind crank right up to fit the cartridge in, don't pull it further than it wants to move. Drop it back down to hold the cartridge in place but do not turn it clockwise or you'll rewind the film into the cartridge. Take the film leader and pull it across to the orange mark below the spool on the right. Check that it rests between the guides and close the back. 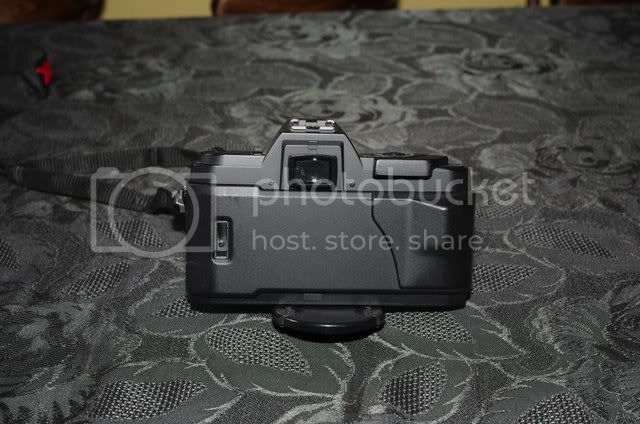 Turn the camera on with the switch on the top plate, set the shutter speed to 1000, wind on and press the shutter. Do this a couple of times. You can shoot frame 0 of the film quite safely, which you'll reach with the third wind. Now add a lens. I replaced the nasty zoom with something from my collection. If you buy one without a lens have a look for a nice Pentax 50mm from the K, M or A series. The last will give you full program mode but the first two are nicer to use manually due to having a metal aperture ring. This K 50mm f1.4 is worth rather more than the camera, but remember that with film the camera makes very little difference providing that it advances film reliably and has accurate metering and shutter speeds. You could put an FA31 on the front and it'd perform as well as it does on any other Pentax film body. To take a photo with this camera you need to switch it on and wind the film on. Now bring it to eye level and check the viewfinder display. In manual mode the recommended shutter speed blinks, with the currently selected speed illuminated steadily (in Program it will illuminate the shutter speed the camera intends to use along with a “P” at the top). Focus using the split prism in the centre of the viewfinder (explained in the manual, but generally you just focus until a line on the subject is smooth across both halves of the centre circle), check composition/level/exposure again, and gently press the shutter button to shoot. Remember to turn the camera off when not in use as it will flatten the batteries. When you get to the end of the film (which will often be one or two frames more than it says on the box) the winder lever will move no further. Flip the rewind crank up (don't open the back yet or you'll wreck the film), press the little rewind button on the base of the camera, and turn the rewind crank to wind the film back into the cartridge. You'll hear/feel it come loose from the take-up spool and retract fully into the cartridge. Now you can open the back and remove the exposed film. For your first attempts any high street lab should be fine, many will offer to scan the negatives and return a CD as well as or instead of prints.